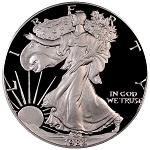 Issued since 1986 the Silver American Eagle offers a modern bullion $1.00 coin for collectors. 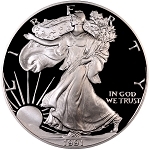 Available in Uncirculated, Proof, and Burnished strikes. Uncirculated examples are shipped to dealers in tubes, we will ship coins in individual flips to protect the coin. Proof Issues are packed from the U.S. Mint in a capsule that is placed into a clamshell box with certificate of authenticity.